Researchers have come up with a new way to build robots, robots that are extremely stretchable and can glow in different colors. Basically they took the existing polymer known as ionic hydrogel which lights up when current is applied and built a robotic shell out of it. To change colors they add different compounds to the hydrogel. The whole idea was apparently inspired by how some octopuses move and change colors. Shepherd’s smart skin has five layers. At its core is an electroluminescent layer of silicone that lights up in different colors when electrified, thanks to phosphor-doped zinc sulfide powder. Small amounts of copper dopants produce skin that lights up blue or green, and manganese gives the skin a yellow hue. To produce white light, the team mixes these metals. This core layer sits between two layers of ionic hydrogel, which serve as electrodes that supply electricity to the core. These three layers are then sandwiched between layers of silicone. Besides being able to glow on its own, it’s also extremely malleable. It can stretch up to six times it’s original length. At the moment, the voltage required to power the skin is high. The group is working on making it thinner so that they can use batteries to power it instead of having to plug it in. This is obviously very cool, even more so when you think of the possible applications. 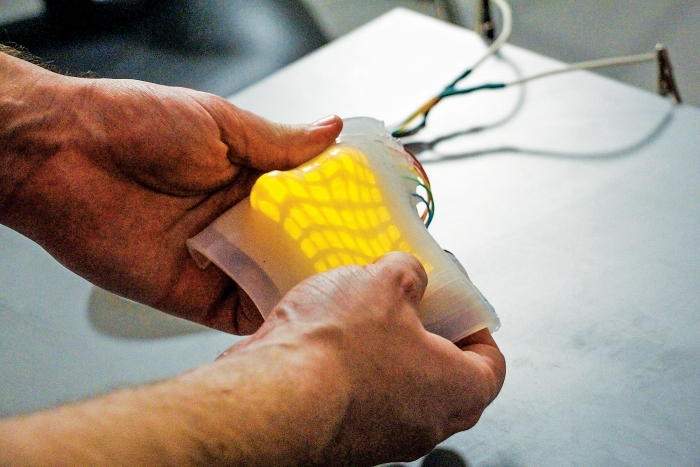 Soft robotics are obvious, but you could use this in consumer electronics just as well. Stretchable and bendable phones for example.